All NEW cast iron pots and skillets have a protective coating on them which must be removed. American companies use a special food-safe wax; imports are covered with a water-soluble shellac. In either case, scrub the item with a scouring pad, using soap and the hottest tap water you can stand. Definition of Mineral Oil: Made from the same basic feed stock as diesel fuel and gasoline, mineral oil is refined until it is water clear and safe for human consumption – but it is indigestible and should never be used for cooking. Basically, it’s a liquid form of Vaseline. Yes, food grade mineral oil could be used to season your cast iron pans. I, personally, don’t recommend using mineral oil because it is not a vegetable-based oil, and I don’t want this type of oil to be used in my cooking that my family is going to eat. USP grade mineral oil is used for laxative relief of occasional constipation and as a skin moisturizer in some cosmetics cream. NOTE: I also make an anti-aging cream that I sell, and I would never use mineral oil in my ingredients for skin care. If you think that you may not use your cast iron pan for a long time, then use food-grade mineral oil rather than vegetable oil, because vegetable oil can eventually go rancid. I have a cast iron pot that I used when I lived in the small African kingdom of Swaziland until 2000. I was very wise in giving it a good, thick coating of cooking fat and wrapping it in newspaper the last time I used it. Lo and behold, after being stuck in a corner in my daughter’s garage for 7 years until I returned here, it is in immaculate condition. I knew I would have to do something with it before I used it again so, as usual, I turned to the web and what do you know, I came across your fantastic web site. After following your tips on re-seasoning, my pot is in use again and I’ve spied my daughter’s rusty old cauldron also in the garage, so I’m going to re-season that one too. We can let that one nestle on the coals on the braai (barbecue). Most of the Swazis use only the cast iron pots for cooking as a lot of them still cook on open fires and they are freely available there on the market, which is where I bought mine for R20.00 (about $3.00). Just think how you’re helping people; half way across the world in Africa. You are now on my favorite list and I’m scouting round for some more pots and am spreading the gospel about your site. I just recently acquired quite a number of rusty corn bread cast iron pieces. I found some writing in a book that said you can clean rusty iron by soaking it in a mixture of white vinegar and water (vinegar 2 parts, water 1 part). It would probably work using straight vinegar but it warns that if you the iron in the vinegar too long the iron will dissolve. The longest I kept the iron in the vinegar was 24 hours. It worked very well and cleaned up the rusty pieces. I just washed with dish soap and hot water to remove residue. Dried the piece well and coated with the following. I had an old book that said 100 years ago they used suet to cure cast iron. I tried suet from the grocery store and I did not like the results because pieces of meat got baked into the coating. I rendered the fat from the suet by cooking it at a low temperature and pouring the fat through cheese cloth. When the fat hardened I took a rag and just wiped the cast iron with the fat. Pre-heated the oven to 425 F. and baked the cast iron for 2 or more hours. Turn off the oven and let the iron cool slowly. When it is cooled it has a shiny oily look but it is as dry as a whistle and they say it is like a Teflon coating but is a lot better for you. You can do this several times and build up the coating as much as you want. Much better coating than using oil but a lot more work. This method creates a lot of smoke so make sure you turn on your fan above the oven or your house will fill with smoke. I also bought new pieces and used this curing method and it worked very well. I have a set of pans, that have been in my family for 4 generations. I remember asking my gram about them one day, she sort of waddled down to the basement, and came up with a complete set. I remember doing some research on cleaning them. Most of which I didn’t care for. But, accidentally, I have found something that I hope will be posted on your web site. Good old fashioned COKE. I filled my sink, and let them soak for about a day. WALLA!!!! they looked like new. I re-seasoned them with bacon grease. Rub the cast iron pan with fine steel wool. Wipe out loose dirt and rust with a cloth. Repeat steps 1 and 2 until the pan is largely cleared of rust. Place the pan on the burner of your stove over medium-low heat. Add enough vegetable oil to coat the pan bottom heavily. Heat for 5 minutes or until the handle is too hot to touch. turn off the heat. Depending on the size of your cast iron pan, add approximately 2 to 4 tablespoons coarse salt to form a paste. The salt acts as an abrasive to gently srub any goop off the surface. Wearing a glove, scrub with a thick wad of paper towels, steadying the pan with a pot holder, scrub the pan, concentrating on the rusted spots but covering all surfaces with the oil and salt mixture. Add more salt or oil as needed. Wash the pan with hot water and dish washing soap. Rinse the pan thoroughly in hot water, wipe dry, and then coat with a thin film of vegetable oil, wiping off any excess oil with additional paper towels. To maintain your cast iron pan after cooking in it, using coarse sale and a paper towel, scrub the pan. Dump the salt out and rinse the cast iron pan in cold water. Wipe dry with a paper towel (if you still get a brown stain on the paper towel, dump more salt in and repeat the process), and then wipe a thin film of olive oil in the pan. I had a well-seasoned cast iron skillet that I overheated and burned off the seasoning in the center of the pan. (Trying to smoke salmon on a cedar plank over a propane fire–the fish was good but it messed up the skillet.) I used the self-cleaning oven method to start over. It appears there was a light coating of rust underneath the seasoning. Did the surface rust underneath the seasoning from scratches that let liquid through? or…? Any concerns over such rust or a method of avoiding it? I used steel wool, corn oil, and Kleen King scouring powder to remove the rust. The oil and the scouring powder removed and floated the rust away. I wiped out the oil with paper towels and then washed with soap followed by lots of water to flush away the scouring powder. Using oil for scouring instead of water prevents new rust from forming if you get interrupted. When using corn oil for seasoning, I’ve found that a newly seasoned skillet turns a golden-brown-copper color. It starts getting darker with extended use but I have one skillet that is still a golden brown after a year of weekly use. Your site is so informative and interesting. I love using my cast iron pots and just yesterday I made meatballs and cooked them in the my cast iron skillet. They cooked so uniformly, and tasted so delicious. After they were cooked, I poured in my sauce (same pan) and let that simmer while I cooked the spaghetti. The spaghetti was cooked in my cast iron Dutch oven. I just read in your information that never to boil water in cast iron pots. I have been boiling my water for the spaghetti and cooking it in the cast iron Dutch oven. It turns out so delicious – best spaghetti we ever tasted cooked that way. So far I have not had any problems with sticking afterwards as we usually rub—another no,no—-olive oil around the pots after use. Now we do not know if we are doing anything wrong here. The spaghetti is soooooooooooo delicious after being cooked in these pots and to do this we have to boil the water first. I read through the archive on cleaning and re-seasoning, and I have a few additional things to add. 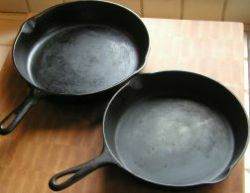 I have recently re-seasoned several pieces of cast iron. I used a propane camp stove to burn off the coating outside. I followed this with a knotted wire cup brush on a 4 1/2 inch grinder to grind off any remaining carbon and rust. If you do not have access to a sandblaster, a rotary wire brush can work very well for cleaning up what does not burn off. It also smooths out the metal a bit as well. To re-season, I washed the cast iron thoroughly, dried it with a towel, then with a bit of heat. Then I rubbed the hot metal with melted solid Crisco, inside and out. I turned it upside down and seasoned on the propane grill with the lid down and the burner turned down as low as it will go. I did this three times for about 15 minutes each time and it came out looking like black glass. The best part is that all the mess, smoke and smell is outside! All of the cast iron that I have seasoned this way is easy to clean. It is as slick as teflon, and cleans easily by boiling a bit of water and then wiping out with a paper towel, followed by a wipe down with peanut oil on the inside. I love my cast iron! It’s a joy to cook with! Just one thing that I would like to add. I have had luck with Dollar Store type Oven Cleaners, when not in a hurry to clean cast iron. It is used in a plastic grocery bag to prevent goo from flowing everywhere and to keep the cleaner in contact with the surface in need of cleaning. I recently purchased a Griswold frying pan from the thrift store and wanted to be able to read all the information on the bottom. I sprayed the bottom only, and let it sit a few days in the grocery bag. In a few days, I could scrub off all the offending carbon build up, and read everything I needed to know, and never harmed the pan’s interior seasoning, which is beautiful. Thanks for a wonderful site! Find a large plastic container. I cut the bottom off of a plastic 55 gallon drum for this (large enough to put everything you wish to clean into). For every 5 gallons of cold water, add one can of “Red Devil” brand lye. Wearing long rubber gloves, gently stir to mix with a wood spoon. Tie a strong piece of string or twine to some point of the cast iron piece and gently ease into the solution. Let stand for a few days, checking progress every two days. Before you know it, your item will look as if it just came from the store. Keeping the gloves on, remove, and place on newspaper to drain off any excess lye solution. Rinse well and wash with hot water and soap before re-seasoning. I’ve done all my cast iron in this manner and several pieces my neighbors, including one pan that looked horrible before cleaned. The solution turns black as tar, yet keeps on working so it really keeps forever in order to clean over and over any cast in need of a new finish. Use a large plastic container (a medium-sized Rubbermaid will do). Add enough cool water to cover the top of the largest piece (remove the cast iron for now, leaving only water). Wear rubber gloves, plus glasses or goggles is good idea too. Lye will destroy almost anything besides plastic so be very careful. Carefully sprinkle several ounces of granular lye into the water. Be careful not to add water to the lye, it will be too concentrated and a vigorous reaction will occur. The lye will dissolve readily. Wear gloves and carefully place the cast iron pan in the solution – no splashing!! Check in a few hours. May take overnight. If it still has not worked after 24 hours, add a little more lye. When complete, rinse pan thoroughly in cool water and pat dry. Repeat the rinse and pat dry again, just to be sure it’s clean. Coat with oil. The old grimy brown solution can be flushed down the drain just like Drano. Remember to flush lots of fresh water down the drain to rinse out the pipes. Store lye out of kids’ reach; it’s deadly poison. Seasoning was a little tricky for me. I ended up doing it too hot the first times. Seems like 300 to 350 F. is about right. I used Crisco and reapplied every 30 minutes or after the pans stopped smoking. They say oil or bacon fat works too. It seemed to help to begin using them even before they got heavily seasoned. My nasty old thrift store cast iron pans are like NEW now, and it was pretty easy. Eggs slide right off onto the plate. My wife could not believe it, heck neither could I, but it’s true! I recently bought a set of three black iron skillets that were made in China. I washed them in soap and hot water then dried them. I set my oven on 400 degrees and proceeded to oil them down with Crisco and baked them for one hour in the oven, one at a time. After I took them out of the oven, they had a dark shiny copper-colored bottom finish. Is this normal? I don’t think so! The skillets were a steel grey color before I put the oil in them. After the seasoning, they took on a dull copper-yellowish hue both bottom and sides outside and inside. Looks a little like a dark gold finish when you shine the light on them. All three skillets had the same results. The bottoms were not a copper bottom finish. They just had that color after I seasoned them. Did not look like copper at all, just had an unusual color that I had not seen before. I have never heard of or seen cast iron pans with a copper bottom finish before. Are you sure they are cast iron, as cast iron pans are usually a silver color after deep cleaning of cast iron, but not copper color? I am curious about the color or your pans. They are indeed cast iron! Bought from Sears on line. Three-piece set by American Origins of Keller LTD. A Division of Columbia Home Products, Terre Haute, In., Made in China. I think I have found the answer. After reading some information on your cast iron web page, you said that company’s outside the United States coat their product with a water-soluble shellac. If I remember my wood-working days, some shellacs have an orange tint to them. Even though I washed my pans with soap and hot water, I guess I did not scrub them hard enough to get rid of the varnish! Evidently I baked the shellac into the pot along with the seasoning! That would give it an orange tint. This morning, I rescrubbed my skillets with Bon-Ami, using SOS pads, steel wool scrubbers, and coiled steel scrubbers. Then I washed them with hot soapy water, rinsed them and put them on the stove to heat a little before re-seasoning them. The first skillet just came out of the oven and the orange hue is gone. Has a nice silver color to it. I called the manufacture and I was told that wax is used in the molding process. They state that you do not really need to wash it off. They recommend to wipe it down with peanut oil and place it in the barbecue because it will smoke a little. I have a question about my cast iron skillet. I have 3 skillets, all over 50 years old (my mom’s and grandmother’s). My husband had to clean them as they were full of rust and layered with grease, rust, etc. We finished them off by putting them in the oven to burn off the excess accumulations and then seasoned them. If it started smoking and the fish burned, your pan had to be too hot. It doesn’t sound like anything is wrong with your cast iron pan. Clean the pan well and then re-season. The generic term “vegetable oil” when used to label a cooking oil product refers to a blend of a variety of oils often based on corn, soybean or sunflower oils. Check out the smoking points of oils.